I see fantastic changes in my clients’ mood, anxiety and resilience when they change the way they eat. Being in control of food often leads to other areas of people’s life feeling more balanced, which increases contentment, and there’s no doubt that all these wonderful nutrients will feed your brain and boost your happiness. Regular meals improve circadian rhythms which can improve sleep. 1. Balance your blood sugar – eating flour and sugar increases our glucose level causing a big rise in our blood sugar. This can make you feel good and boost energy in the short term, but is followed by a sugar crash resulting in cranky mood, low energy and cravings. Avoiding refined flours and sugar and eating more protein (meat, fish, nuts, eggs, pulses) with each meal, along with plenty of good fats (see below) will help stabilise blood sugar levels making your feel energised and happy. 2. Balance your digestive system – bloating, constipation and discomfort can make your feel really miserable and deplete your vitality. Bacteria in our gut and liver support our neurotransmitters (see more on neurotransmitters below). Work with a Nutritionist to remove any foods you are intolerant too, and balance your gut flora with multi strain probiotics. 4. 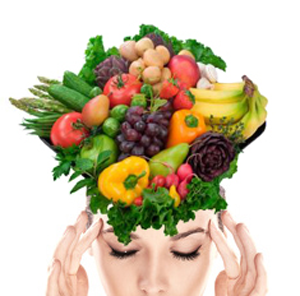 Feed your brain to balance your neurotransmitters (these regulate our mood) – our brains love good fat especially oily fish (or Omega 3 supplements if you don’t like fish), but also avocados, egg yolks, cold pressed flax oil or extra virgin olive oil, walnuts and pumpkin seeds. Our neurotransmitters also need quality protein, ideally grass fed meat, wild fish and free range eggs. Vegetarian or vegan protein may not be enough to make the building blocks to keep our mood balance for some people, so supplements may be needed. 5. Other happy supplements are magnesium (found in green leafy vegetables) which is nature’s tranquiliser, B complex (found meat and wholegrains) which helps balance mood, and Vitamin D, the sunshine vitamin. 6. If you suffer from anxiety, reducing caffeine can really help, especially coffee from coffee shops which can have up to 3 shots of caffeine. 6. Finally, surround yourself with happy people. I listened to The Happy Pear podcast recently https://thehappypear.ie – two identical Irish twins dedicated to health on a Happiness mission– very inspirational!